Invigorating song of praise with simple actions for your children’s choir. 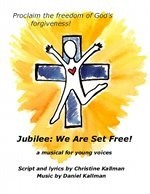 This is the title song from the youth choir church musical, Jubilee, We Are Set Free! Listen, view score, and purchase. Jubilee! We are set free! Alleluia! Free to love! Free to give! Alleluia! Free to hope! Free to live! Alleluia! Free to start a new day! Alleluia! Turn and walk a new way! Alleluia! I lay before your altar and regain my whole life there! It’s not by anything I’ve done, but simply by your grace. I turn and find I’m living in an alleluia place!